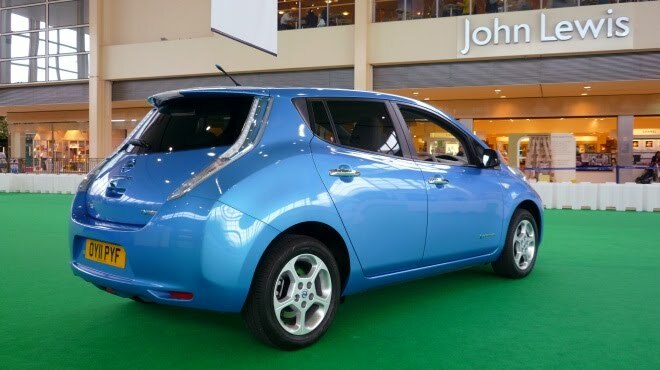 As if to underscore its suitability for popping to the shops, Nissan chose a sprawling shopping mall in Milton Keynes to launch its Leaf electric car in the UK. As a result I can attest that Nissan’s baby is eerily quiet while making 4mph progress on a polished tile floor. Fortunately the Leaf can just about fit through a shopping centre’s double doors, so I was able to attempt slightly higher speeds on more challenging surfaces. This is the fourth iteration of Nissan’s EV I’ve tested: starting with a Cube-based mule, then a Tiida-based mule, a left-hand-drive Leaf prototype and now the finished Leaf in UK spec. Unsurprisingly, the retail version presents relatively few surprises: like its three progenitors it’s ultra smooth, very quick off the line, extraordinarily quiet and effortless to drive. A lack of novelty did help me to focus on some of the details I might otherwise have missed. I am still smitten with the Leaf, but I’m no longer blind to its faults. The steering is a lot lighter than I’d like, for example, and seems to get lighter still beyond a quarter turn of lock. I’d also like my fingers to feel some neatly stitched leather, rather than squishy plastic. There’s currently no option to upgrade the steering wheel’s trim, nor to swap the pale grey velour upholstery for something more practical. Out on the road I can’t help noticing that there’s not much room for my left foot down in the right-hand-drive footwell. And while the ride is mostly soft and comfortable, things can get a little bouncy over big undulations. On rough, rutted corners the Leaf can squirm and shimmy a bit too. Those few quibbles aside, the Leaf remains a hugely impressive piece of engineering and a very pleasant way of getting from A to B. The long list of good points starts with the much talked-about torque of electric motors, where maximum grunt is on tap from zero rpm. Floor the throttle from a standstill and you’ll unleash a firehose of acceleration. 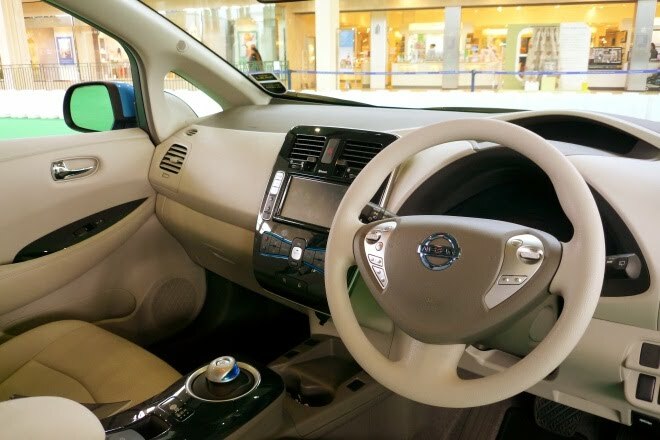 The Leaf is so eager to gain speed it can leave the driver behind – launch onto a roundabout with full force and you may struggle to twirl the wheel quickly enough to stay in lane. While tyre-twisting starts may be fun, they aren’t really the humble Leaf’s proper calling. Palm the transmission mushroom from Drive into Eco mode and all your getaways will be suitably sedate. Throttle response becomes muted, and regenerative braking becomes more pronounced. Oddly, I found myself wanting a third way. It would feel more natural for the stronger level of regeneration to be paired with brisker acceleration, and the leisurely throttle to come with much lighter retardation. At any rate, I found myself longing for the setup in Volvo’s C30 Electric, where the gear lever toggles not between two distinct personalities, but simply between regen and no regen. No doubt I’d be grateful for the Leaf’s Eco mode if I was feeling anxious about getting home. The Leaf does at least keep its driver fully informed about remaining range, and will respond quickly to certain changes in behaviour. My fully charged Leaf predicted 105 miles’ range at startup, but switching on the air conditioner before setting off immediately cut the figure to 77 miles. Fortunately, this vanished range can be restored simply by switching the climate control off again. And there is also the option to preheat or pre-cool the interior remotely, while the car is still plugged in, to spare the batteries. Helpfully, the dashboard provides a reminder of how long it would take to fully recharge the battery from its current level. For home charging there are two options – plugging into a standard 3-pin plug will draw 10 amps and will fully charge a low battery in 10 hours or so. 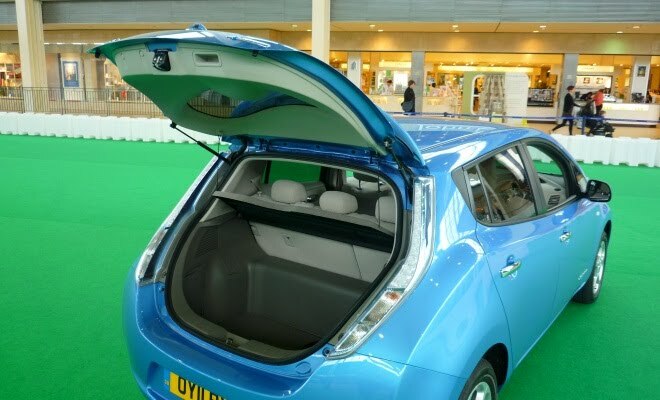 Alternatively, a £1,000 wall box supplied and fitted by energy firm British Gas will pump power in through the Leaf’s nose at 16 amps, meaning a full charge in seven to eight hours. Away from home there’s also the 500-volt fast-charger option, assuming your route runs close enough to one of the selected Nissan dealers that offer one. This will yield an 80% charge in fewer than 30 minutes. Out on the road, predicted range will tumble if you travel at sustained high speed, and will climb slowly back up again once you move onto slower roads. The centre-console satnav screen can be configured to display how far you might travel on the current level of charge, I was disappointed to note that the software draws simple circles – there’s no attempt to indicate that you’ll probably manage fewer miles on the M3 than the A3, for example. It also didn’t seem possible to view a smaller circle denoting there-and-back range, which might be more helpful given that most electric car drivers tend to charge at home. There is a companion “Carwings” iPod application and equivalent PC software, which offers more sophisticated route-planning routines. Alas I didn’t get to try out these tools. The Leaf is by far the quietest and smoothest car I’ve ever driven – Nissan says it is substantially more refined than its own luxury Infiniti saloons and I don’t doubt that’s correct. Driving at 30mph down a country lane I could literally hear the birds twittering in the hedgerows. So quiet is the Leaf’s progress, Nissan has had to work hard on suppressing sounds that are normally drowned out by the engine’s drone. The wiper motor is especially silent, for example, while the headlamps stand proud of the bonnet so as to direct airflow in a more whisper-like path around the door mirrors. After about 60 miles of spinning around Milton Keynes’ roundabouts, blatting along dual carriageways and threading along country roads, the range prediction had dropped to 24 miles. It was time to head back to the shopping centre and hand back the keys. Or rather the keyless-start keyfob. So – to the bottom line. 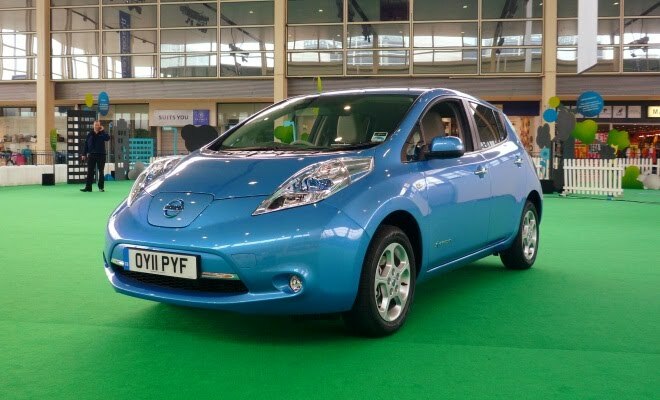 After its recent price hike the Leaf costs £25,990 after the government rebate, which feels like a lot of money. Yes it will be very cheap to run, should retain a lot of value and will be unbeatably tax efficient as a company car. But for most people, financially, it’s going to be hard to justify next to a much cheaper modern hybrid like Toyota’s Auris HSD. To buy a Leaf, you’ll need to really want one, in that heart-over-head way that justifies so many otherwise unjustifiable automotive purchases, from lumbering 4x4s to cramped two-seaters. The good news is, if you do feel a passionate urge to go electric, the Nissan Leaf is a very good car – a deserving winner of its European Car of the Year crown.